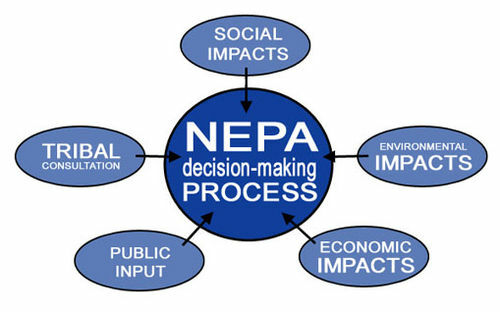 Graphic illustrating the components of the NEPA process. The National Environmental Policy Act of 1969 (NEPA) (42 U.S.C. 4321 et seq.) - Enacted in 1970, NEPA established a national policy to encourage productive and enjoyable harmony between man and his environment and to promote the prevention and elimination of damage to the environment and biosphere. At the heart of NEPA is the requirement that federal agencies or departments must consider the environmental impacts of all major federal actions significantly affecting the human environment. NEPA is strictly a procedural statute that requires federal agencies to conduct an environmental review of the action, unless the action is otherwise exempt. NEPA reviews consider the environmental impact of the proposed action, any adverse environmental effects which cannot be avoided should the proposed action be implemented, alternatives to the proposed action, the relationship between local short-term uses of man's environment and the maintenance and enhancement of long-term productivity, and any irreversible and irretrievable commitments of resources involved in the proposed action. NEPA reviews can take in the form of an environmental assessment (EA) or an environmental impact statement (EIS). Additionally, NEPA created the Council on Environmental Quality (CEQ) in the Executive Office of the President of the United States. CEQ is composed of three members who are appointed by the President of the United States as well as additional officers and employees necessary to carry out CEQ's powers, duties, and functions listed in NEPA Sec. 204 (42 USC § 4344). For more information on "major" actions and other NEPA issues, see the NEPA Section on the Council of Environmental Quality web site. The National Environmental Policy Act of 1969 (NEPA) arose out of a growing sentiment for environmental protection in the late 1950's and 1960s. Congress enacted NEPA as the foundation of an overarching national policy to protect the environment. One author close to the legislative drafting has since stated, "the challenge was to approach environmental management in a comprehensive way. The new values of environmental policy had to intrude somehow into the most remote recesses of the federal administrative machinery and begin to influence the multitude of decisions being made by thousands of officials." (Drefus & Ingram, The National Environmental Policy Pact: A View of Intent and Practice, 16 Nat. Resources J. 243, 246 (1976). Congress achieved this goal through the procedures required in 43 USC 4332(2)(C) to include a detailed statement of the environmental impacts of every major federal action significantly affecting the quality of the human environment. As interpreted, NEPA is a procedural statute requiring federal agencies to consider all potential significant environmental impacts before acting. Starting with Calvert Cliffs' Coordinating Comm., Inc. v. United States Atomic Energy Comm'n 449 F.2d 1109 (D.C. Cir. 1971), NEPA has been constantly enforced, challenged, and interpreted through the United States court system. Generally means, activities resulting in no disturbance or a negligible disturbance. A process in which a federal agency relies on a existing NEPA analysis to document the rationale for concluding that there will be no new significant environmental impact that would require an environmental assessment or environmental impact statement. A category of actions which do not individually or cumulatively have a significant effect on the human environment and which have been found to have no such effect in procedures adopted by a federal agency in implementation of NEPA regulations and for which neither an environmental assessment or environmental impact statement is required (CEQ Regulation Sec. 1508.4). A concise public document for which a federal agency is responsible that provides sufficient evidence and analysis for determining whether to prepare an environmental impact statement(EIS), aids an agency's compliance with NEPA when no EIS is necessary, and facilitates the preparation of a EIS when necessary (CEQ Regulation Sec. 1508.9). A detailed written environmental review statement as required by NEPA Section 102(2)(C) (42 USC 4332). The EIS includes, the environmental impact of the proposed action, any adverse environmental effects which cannot be avoided should the proposed action be implemented, alternatives to the proposed action, the relationship between local short-term uses of man's environment and the maintenance and enhancement of long-term productivity, and any irreversible and irretrievable commitments of resources involved in the proposed action. NEPA reviews can take in the form of an environmental assessment (EA) or an environmental impact statement (EIS). Have a NEPA Document Collection to add that doesn't yet exist in this collection? One Nevada EIS NV Energy, Inc.
DOE-EA-1116 EA Steamboat Springs Geothermal Area Exergy, Inc.
DOI-BLM-NV-W010-2011-0100-CX CX Ormat Nevada Inc.